The site of Fort Stark, on the southeast point of New Castle Island known as Jerry's Point, or Jaffrey's Point, has been fortified in one form or another since 1746, when Battery Cumberland, consisting of nine 32-pounders, was located here to defend against the French. The exact location of these guns has never been determined, but probably on the northeast tip of the peninsula. The point was refortified by 1774 when the New Hampshire colonial legislature voted in 1775 to rebuild the old earthworks, with new wooden gun platforms and barracks, along the entire eastern side of the point. The eight guns here at that time (two 32-pounders and six 24-pounders) were removed by the local militia in May 1775 and transferred to the new works then being built on Peirce's Island (Fort Washington) and Seavey's Island (Fort Sullivan), as well as another new redoubt at Clark's Point/Shaw's Hill on the northwest arm of New Castle Island. Additional guns were later emplaced at Jerry's Point in September 1775 from Fort William and Mary, courtesy of the December 1774 raid. The Jerry's Point Battery was used until 1778, after which it fell into disrepair. In 1794 a "heavy" battery was built here, part of the Federal "First System" of fortifications. It was garrisoned in 1812-14 by a company of 120 local militiamen under Captain William Marshall, and armed with nine guns, consisting of both 6- and 9-pounders. After 1815 the fort was abandoned. 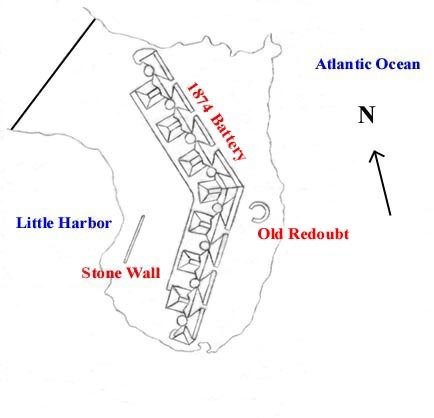 The "Old Redoubt", labeled as such on an 1872 map, is thought to be the same feature that is found on an 1844 map featuring new work built in 1842, but may also be from the original 1794 fortification. In 1982 some stone and Rosendale cement rubble was uncovered near the shoreline in front of Battery Hunter, but it was later determined to be probably part of the foundation of the 1870s fortification project. The remnants of a stone wall, which may date to the original 1794 fortification, are located behind Battery Hunter and Battery Lytle. Plans were drawn up in 1861 for a massive stone and earthwork fortress, but it was never built. It is unclear whether the old redoubt was in use during the Civil War period. In 1872 the federal government purchased Jerry's Point and construction was started in 1873 for a so-called "Fourth System" concrete and earthwork 12-gun barbette battery known as Battery on Jerry's Point or Battery Stark, mounting 15-inch smooth-bore Rodmans in double bays with traverse-magazines. 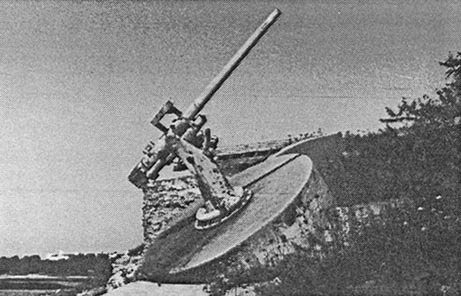 The old stone redoubt was also projected to have three "heavy guns" mounted on wooden platforms. In 1874 the plan was reduced to eight batteries in single bays, due to financial constraints. The fort was two-thirds finished when, in 1876, all construction was abruptly halted. Minor work was attempted in 1879, and again in 1885-86, before it was finally abandoned. There is no record of the guns ever being placed into position during this time, but the platforms and magazines were reported to be serviceable. A half-buried portion of the retaining wall of Battery Position 8 can still be viewed on the south side of Battery Hunter, next to the Oil Storage House and gun blocks of New Battery Lytle. as shown in The Thoresen Group Study, 1983. In 1887 the Jerry's Point Lifesaving Station was built on the western side of the point, along with a small wooden pier. The large stone breakwater on the southern tip of the point was constructed by the U.S. Army Corps of Engineers in 1898, along with the larger Engineers' wharf just west of the breakwater. The Oil Storage House was built in 1903 to service a small light beacon (which no longer exists) at the end of the breakwater. The station remained in service until 1908, when the Portsmouth Harbor Lifesaving Station was built to replace it, located just offshore from Fort Foster on Wood Island. In 1899, following the Spanish-American War, two 8-inch breach-loading rifles, Model 1888, on converted 15-inch Rodman iron carriages, were emplaced on the parapet of the 1874 work. They were dismantled in 1900 and shipped to Fort McKinley, Casco Bay, Maine. 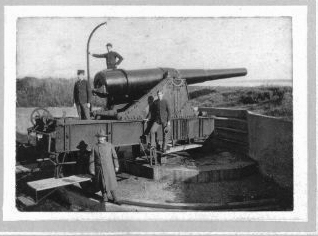 The original caption of this otherwise unidentified photo claimed this was the Jerry's Point Battery. If so, this is the only known photograph in existence. In 1900 four new concrete batteries were planned for construction, and the reservation was officially named Fort Stark, after General John Stark, commander of the New Hampshire Militia during the American Revolution. (see also N.H. war heroes) An artesian well was dug in 1901. Gun positions 5, 6, and 7 of the 1870s project were completely demolished for the construction of Battery David Hunter, named in honor of Civil War era Major General David Hunter, which was completed in 1904. This battery consisted of two 12-inch 35-caliber breach-loading rifles, Model 1895 M1, serials 39, 5 (Watervliet Arsenal and Bethlehem Steel Co.), on disappearing carriages, Model 1897, serials 35, 34 (Midvale Steel Co.). 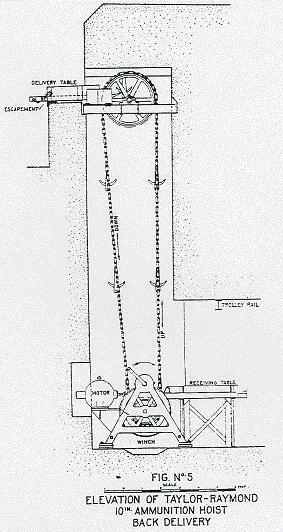 Two General Electric Taylor-Raymond back-delivery projectile hoists carried the ammunition up from the lower magazines. 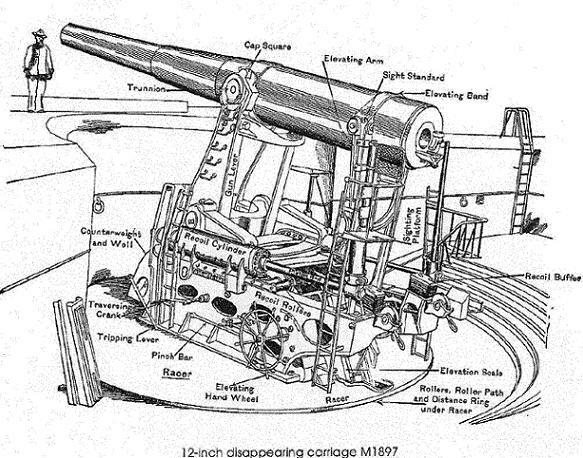 A diagram of a 12-inch gun on a M1897 disappearing carriage. 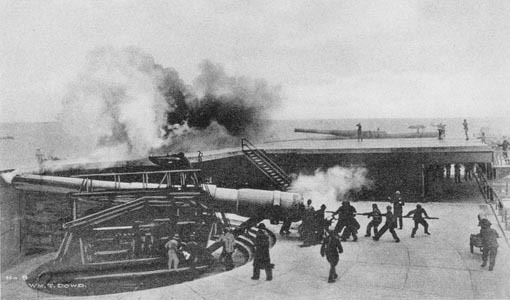 A 12-inch D.C. gun battery in action, WWI era. Battery Parrott, Fort Monroe, Hampton, Virginia. 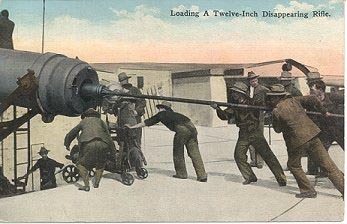 Reloading a 12-inch gun, WWI era. 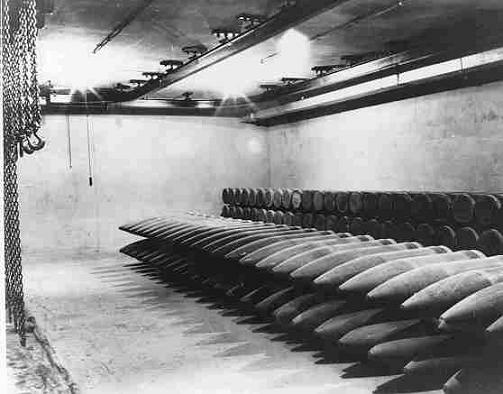 A shell room with M1895 12-inch shells, showing a typical layout. located at Fort Pickens, Pensacola, Florida. See Coastal Fortification on the Gulf of Mexico, by Andy Bennett, for more info. Gun positions 1-4 of the 1870s project were partially destroyed and buried for the other new batteries under construction. Battery Edward Kirk, named in honor of Brigadier General Edward N. Kirk, killed in action in Tennessee in 1862), was completed in 1904 north of Battery Hunter, and consisted of two 6-inch rapid-fire guns, Model 1903, serials 7, 30 (Watervliet Arsenal), mounted on disappearing carriages, Model 1903, serials 7, 8 (Watertown Arsenal). Battery Alexander Hays, named in honor of Brevet Major General Alexander Hays, killed in action in Virginia in 1864, was constructed north of Battery Kirk, and Battery William Lytle, designated after Brigadier General William H. Lytle, killed in action in Georgia in 1863, southwest of Battery Hunter. Both were completed in 1905, and armed with two 3-inch shielded rapid-fire guns, Model 1902, serials 41, 42, 39, 40 (Bethlehem Steel Works), on pedestal-mounted Model 1902 barbette carriages. In 1905 Fort Stark became a subpost of Fort Constitution, and was manned by a detachment of the 124th Company, Coast Artillery Corps, U.S. Army until 1907 when replaced by the 156th Company (Mines), Coast Artillery Corps, U.S. Army. A temporary wooden and concrete mine casemate was built in 1907 behind Battery Kirk to replace the one built earlier at Fort Constitution. The Primary Mine Observation Station (M') was completed in 1909 behind Battery Hays. The now exposed concrete instrument pedestal was once enclosed by a three-story wooden building, and originally supported a depression-position range-finding (DPF) instrument, which was used to triangulate the position of a ship in the mine field in the harbor. The Lifesaving Station, closed in 1908, was then used as barracks. Other buildings built were an Engineering Department Office, coal shed, lavatory, carpenter and blacksmith shop, storage rooms, and a water tank. The Engineering Dept. Office was replaced with the Ordnance Machine Shop in 1910. An electric generator was built in 1909 to supply lights to all the batteries, and to power a 60-inch General Electric searchlight (harbor position #3) installed in 1922, located on a rail-car on a track running out to the end of the wharf by Battery Lytle. 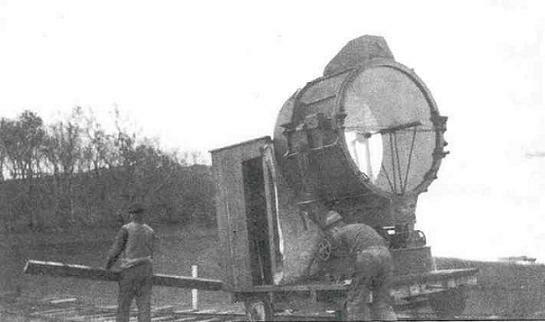 A truck-mounted 36-inch searchlight was also used here. Map based on 1910 US Army Corps of Engineers site map. A two-gun anti-aircraft battery was proposed to be built here in 1915. It was instead located at Camp Langdon, situated on the road halfway to Fort Constitution. Several buildings were demolished here and newer ones built. A barracks and a garage were added, as well as a recreation building and a post exchange. 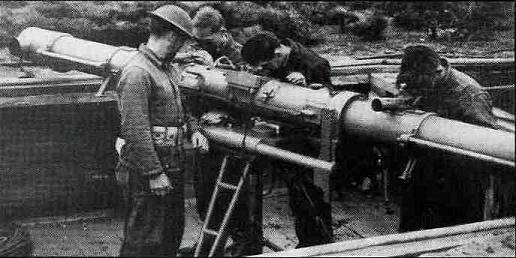 In 1917 the guns of Battery Kirk were removed and sent to Watertown Arsenal, Mass., for conversion into railway artillery to be used by the American Army heading to France. The gun carriages were finally removed in 1921. 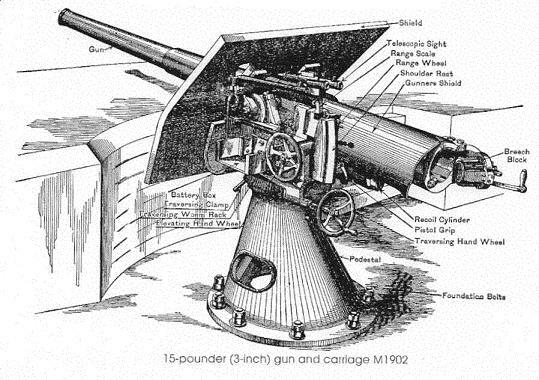 In 1920 Coincidence Range-Finder (CRF) stations were built atop Batteries Hays and Lytle. 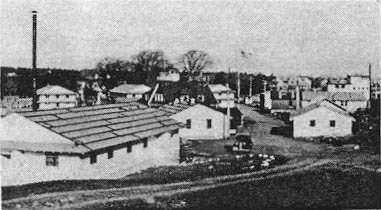 The temporary mine casemate was demolished as a new one was now built at Fort Constitution. 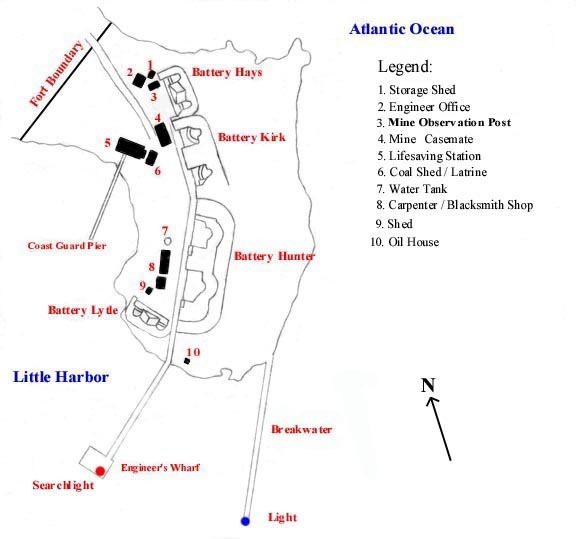 The Mine Observation station (M') was transferred to Fort Constitution in 1921, and its building then became the Primary Fire Command (F') observation station, later to be designated the Harbor Defense Command (H) and Gun Group (G1) observation station in 1941. The fort was then placed on care-taker status, with a detachment from Battery E, 8th Coast Artillery Regiment (Harbor Defense), U.S. Army, based in Portland, Maine, living in the old Lifesaving Station that had previously been converted into barracks. In 1932 the Engineers' wharf was destroyed by fire during National Guard training exercises, and was not rebuilt. The searchlight was also destroyed. The fort was reactivated in 1941 by the new 22nd Coast Artillery Regiment (Harbor Defense), U.S. Army, and many new buildings were constructed. The old barracks were replaced by three new wood frame barracks. A mess hall, fire station, Officers' quarters, Quartermaster Supply building, gate house, and other supply and office buildings were constructed. The 30-man gun crew for Battery Hunter lived inside the bunker when on alert status. Other personnel were billeted at Camp Langdon. photo by Joe Rice, courtesy of Bernard Keenan Jr.
Bernard J. Keenan Sr. at gun #2 of Battery Hays, in late fall 1941. 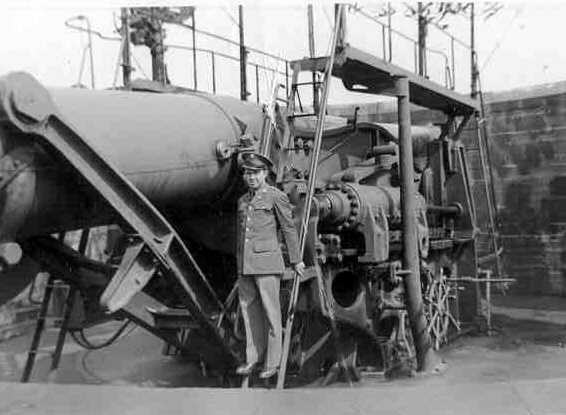 He was shipped out to the Pacific in January 1942.
photo courtesy of Bernard Keenan Jr.
Bernard J. Keenan at Battery Hunter, from 1941. 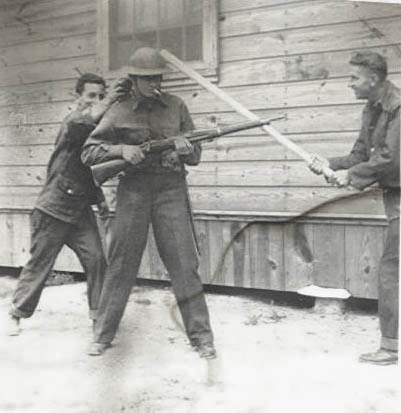 Bernard J. Keenan on left with rifle, from 1941. Bernard J. Keenan in center with rifle, from 1941. 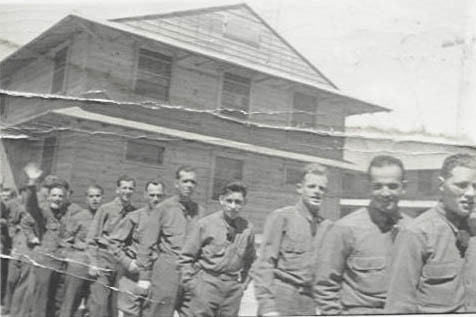 1941 photo of squad at Fort Stark. The old Lifesaving Station was converted into the Navy signal tower (or Navy HECP) where signalmen alerted the Coast Guard picket boat to open or close the gate in the anti-submarine net, which stretched from Fort Stark to Fort Foster across the harbor. Battery Kirk was converted into the combined Harbor Entrance Control Post (or Army HECP) and Harbor Defense Command Post (or HDCP) in 1942. This served as the communication and command center to control the entire Portsmouth Harbor Defense Area, which extended from Cape Porpoise, Maine, to Cape Ann, Mass.. It was built to resemble the superstructure of a navy ship, and was painted dark gray during the war. 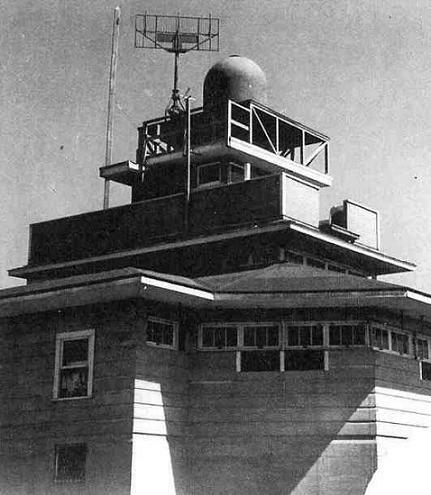 The top of the structure housed an SCR-682 area surveillance radar within a radome. 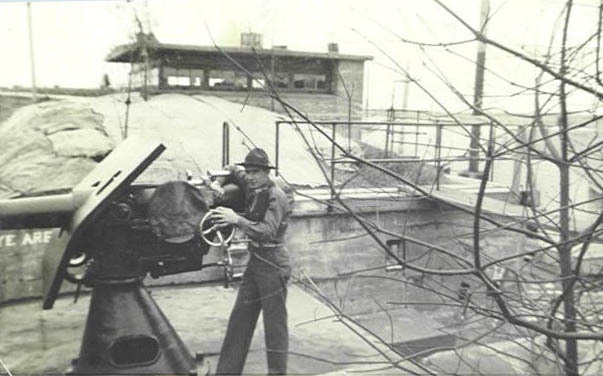 The HECP at Fort Stark as it appeared shortly after WWII. Note the wooden railings, and the strange object covering the base of the signal mast (left center). atop the HECP at Mishaum Point Military Reservation, South Dartmouth, MA, circa 1945. 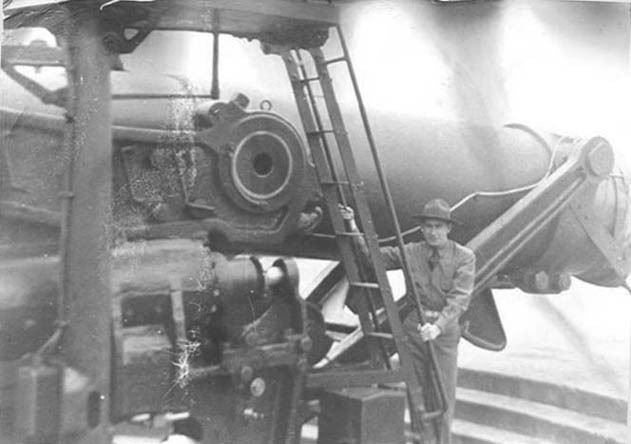 Battery Hays was deactivated in 1942, and Battery Hunter remained in service until 1944, when Battery Seaman with its two 16-inch guns at Fort Dearborn came into service. Battery Lytle remained in service until 1942, when New Battery Lytle was built adjacent to Battery Hunter near the Oil Storage House, in order to increase the field of fire to the expanded anti-submarine nets and minefields in the harbor. The old guns of Battery Lytle were then transferred to Battery Hackleman at Fort Constitution, and the guns of Battery Hays were transferred to New Battery Lytle, which consisted only of two circular concrete blocks about 50 feet apart along the top of the old 1874 parapet wall, with an earth-covered concrete ammunition magazine between the gun mounts. The #2 block remains today underneath brush and ground cover. The #1 block has been washed out from underneath by the ocean and almost destroyed. 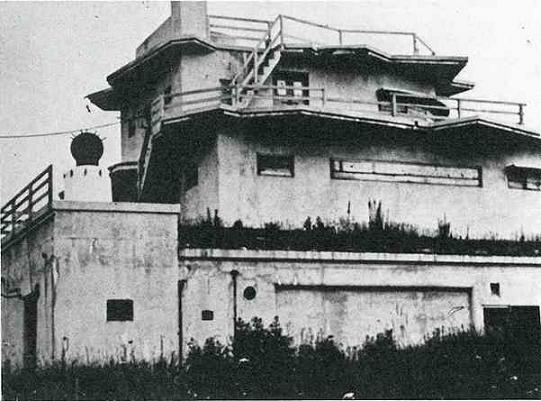 The combined Battery Commander's station and Coincidence Range-Finder station for New Battery Lytle was built adjacent to the #1 gun position of Battery Hunter. In 1945 Anti-Motor Torpedo Boat (AMTB) Battery 953 was authorized to be emplaced at Fort Stark, utilizing one of the existing batteries (most probably Battery Hunter). It was to have two shielded fixed-mount 90mm guns. It was never built. 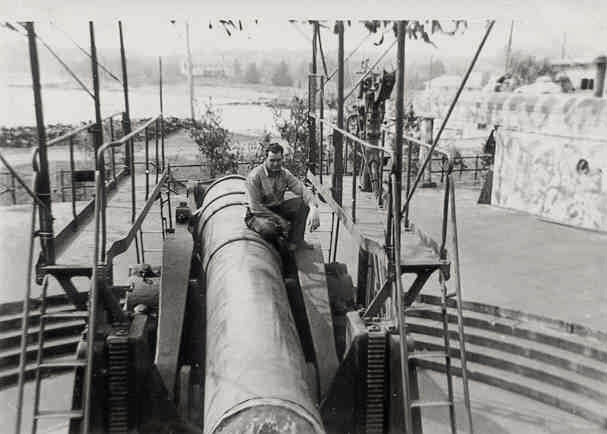 from "Waiting for the Enemy: Memoirs of a WWII soldier serving in wartime New England and Europe"
PFC Norman E. Hope, Battery C, posing on 12-inch gun of Battery Hunter. 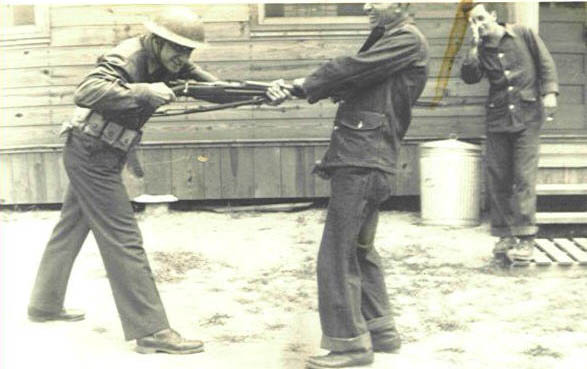 PFC Hope's duty was closing the breech after loading the gun. He was shipped out to Europe in 1945.
from "Waiting for the Enemy"
Serviceman Joe Tye on the #2 gun of Battery Hunter. Note the camouflage netting above the gun and the paint scheme on the walls. 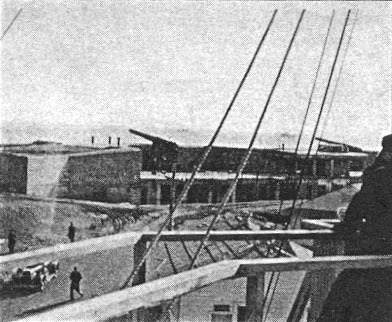 Enlisted Barracks (left), Mess Hall, and PX in foreground. former M1 OP (left background), and Battery Kirk-HECP (center background) in trees. Map based on 1945 US Army Corps of Engineers site map. 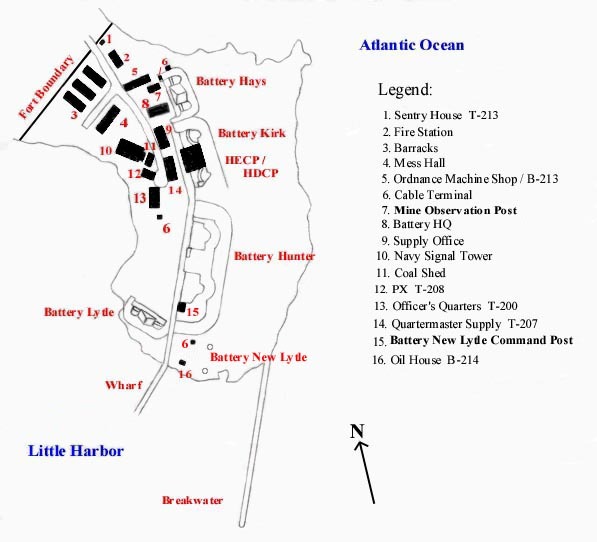 In 1948 all remaining Harbor Defense Commands were disbanded, the remaining guns scrapped, and in 1950 the fort was declared surplus property. The U.S. Navy then acquired the fort, and stationed about 30 Ships-Keepers and a civilian technician for harbor defense operations. Most of the abandoned equipment was restored, including some mines and monitoring components and hydrophones. They messed at Camp Langdon, and stayed until 1953. Many of the former Army buildings by that time had been destroyed for safety reasons, including the Lifesaving Station, the fire station, mess hall, the three barracks, and the Battery office buildings. 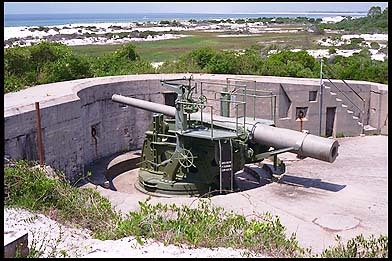 The #1 gun of New Battery Lytle (USS THRESHER Memorial) as seen in 1983 before removal. In 1978 the federal government retroceded to the State of New Hampshire the two portions of the reservation on either side of the fenced-in area around Battery Kirk, totaling 8.49 acres, for parks and recreation usage. In 1983 the remaining portion was ceded to New Hampshire, bringing the total acreage of the park to 10 acres. All remaining buildings were then destroyed, except for the Ordnance Machine Shop and the batteries themselves. The entire area of Battery Kirk is closed to the public for safety reasons. The Ordnance building functions as the park's visitor center, but is open only on summer weekends or by appointment through the "Friends of Fort Stark", a local preservation group founded in 2007 after seeing the park unstaffed and neglected after 1998. There is otherwise no outside interpretation at the fort. Interior access to all batteries has been closed since 2002 due to vandalism. Admission to the park is free, but with limited on-site parking. Read about the story of Lester Stevens, who served at Fort Constitution in 1941-45 with the mine planter ships, and who later became the park ranger for Fort Stark from 1991-98, in an article from The Atlantic News, December 5 and 12, 1996. 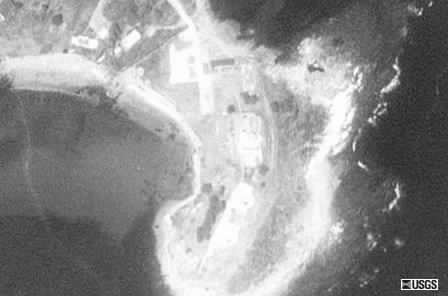 A 1992 USGS Satellite Image of Fort Stark.